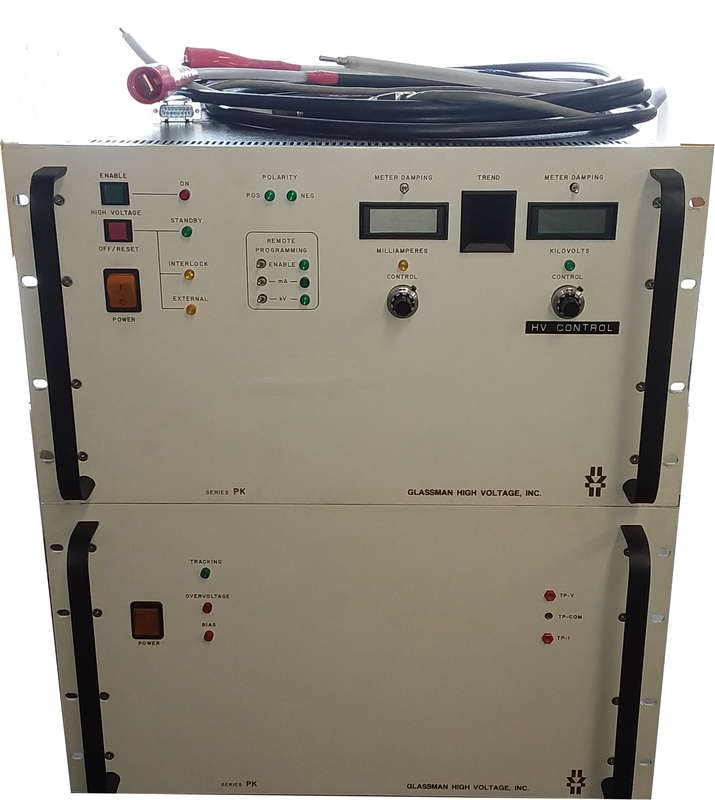 Glassman High Voltage PK008P900XC2 8kw DC Power Supply. 0-8kV / 900 mA. Positive output. Requires 208V 3-phase AC input. PK008P450 master plus slave. Pulse-Width Modulation. Off-the-line pulse-width modulation provides high efficiency and a reduced parts count for improved reliability. Air Insulated. The PK Series features “air” as the primary dielectric medium. No oil or encapsulation is used to impede serviceability, or increase weight. Constant Voltage/Constant Current Operation. Automatic crossover from constant-voltage to constant-current regulation provides protection against overloads, arcs, and short circuits. Current Trip. This feature may be substituted for constant-current operation by a jumper on the rear panel interface connector. Tight Regulation. Voltage regulation is typically better than 0.01% for allowable line and load variations. Current regulation is better than 0.1% from short circuit to rated voltage. Higher Power Capability. Power supply modules can be paralleled for 8 kW output power utilizing one master control module and one slave module. Operating Parameters at a Glance. Output voltage and current are displayed on separate 3 1/2 digit LCD displays with selectable damping. Dual LED bar graphs provide “analog” indication of rapidly changing output level. A full set of indicators are provided to determine the status of the supply at a glance. These include indicators for AC power on, high voltage on, standby, safety interlock, external trip, output polarity, regulating mode (voltage or current) and remote control status of mA program, kV program, and HV enable.